This post is a guest blog post by Ben Long of Resource Media and was originally published on their website. In 1973, America took a stand against extinction when Congress passed the Endangered Species Act to protect our nation’s most vulnerable wildlife. The law was unprecedented and an example of global leadership. All Americans deserve a chance to thrill at the grace of a trumpeter swan on the wing, or the majesty of a grizzly bear roaming the wilderness. Every year, more than 140 million Americans continue to enjoy their country’s natural splendor in many ways. Healthy plant and animal communities keep our water clean, pollinate our crops, and protect our homes from floods and storms. Plants keep streams and rivers from flooding and filter pollution from our water. Insects like Lange’s metalmark butterfly pollinate wildflowers and other plants including food crops. The small Santa Cruz evergreen cypress helps forests and streams to rebound after forest fires. Wildlife gets kids excited about being outdoors. Kids who spend time outdoors are less likely to be obese, depressed or suffer from anxiety. American history has hinged on — and been inspired by — wildlife, from beavers to bison to the bald eagle. America’s founders chose the bald eagle as a national symbol. Bison, featured on some of America’s earliest coins, once fed Native Americans and pioneers across North America, but were reduced from tens of millions to a few hundred. The fact that bison and eagles escaped extinction is testament to America’s conservation ethic. Wildlife-related industries, such as fishing and birding, generate tens of billions of dollars annually for the American economy and support millions of jobs. Anglers strive to catch fish like chinook salmon and steelhead trout, while birders travel long distances to glimpse rare birds like the Gunnison’s sage grouse or piping plover. Wild plants and animals contribute to the discovery of new medicines and technologies every day, and help combat diseases in our most important food crops. Pharmaceutical companies now replicate taxol, a cancer-fighting agent originally found in the Pacific yew shrub. Agronomists helped save the American corn and the American walnut crop from destructive blights by isolating genetic traits from a primitive, wild species. 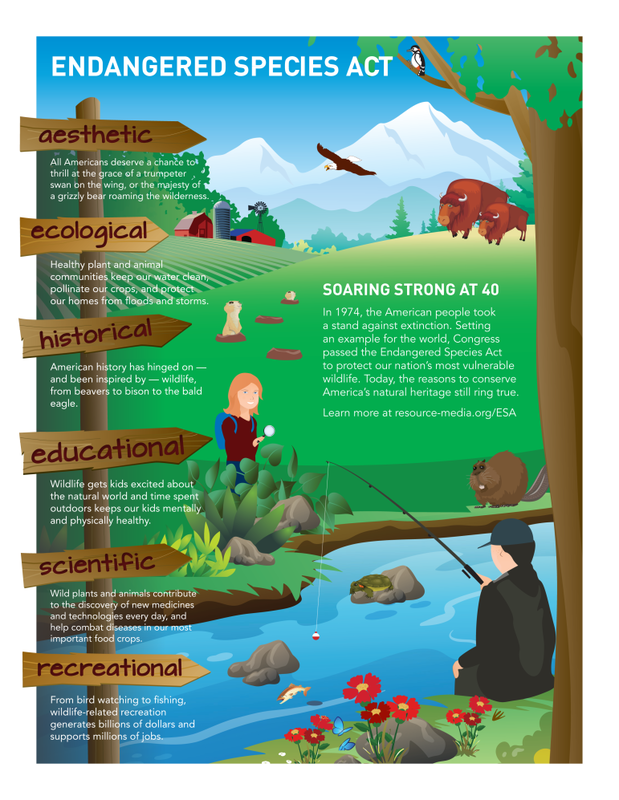 While these core values remain unchanged, many of the threats faced by America’s natural ecosystems have grown since the passage of the Endangered Species Act, and unexpected challenges are emerging as well. Climate change brings new perils to wildlife across the nation, from rising seas to insect-killed trees. And today, nearly 100 million more Americans are competing for land, water and natural resources than on the day President Nixon signed the Act into law. The Endangered Species Act allows us to tackle all the challenges facing our wildlife legacy – including those that we couldn’t have imagined in 1973 – while helping balance America’s growth and economy with our responsibility to be good stewards of our natural resources for future generations. 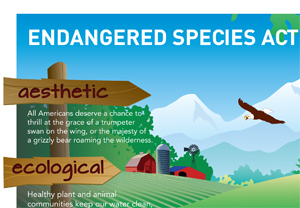 Endangered Species Act Infographic (Click to enlarge).